As I mentioned at the beginning of this article, I tasted my first German wine in 1971; I was inspired in large part by reading Frank Schoonmaker’s Encyclopedia of Wine. At the time, Schoonmaker was the closest thing America had to a wine guru. He wrote articles on wine for various magazines, produced some classic works on wine, including the aforementioned Encyclopedia and The Wines of Germany, and his name appeared on the necks of many German wine bottles imported in the US as “Frank Schoonmaker Selections.” As a devotee of Mosel wines of long standing, I have to confess I was disappointed with my first German wine, a 1967 Egon Müller Scharzhofberger that I found somewhat austere. Shortly thereafter, however, I was captivated by a series of 1966 Rheingau Spätlesen: von Simmern’s Hattenheimer Nussbrunnen, the Eltville State Domain’s Rauenthaler Gehrn and Steinberger, and the Schloss Vollrads noted above. It is possible that my inexperience affected by judgment, my tastes have changed or my memory is distorted; however, since that time I rarely have tasted a collection of Rheingau Spätlesen as satisfying as these. In any case, I was bitten by the German wine bug, purchased a copy of Schoonmaker’s Wines of Germany and began to explore promising sources of German wine. 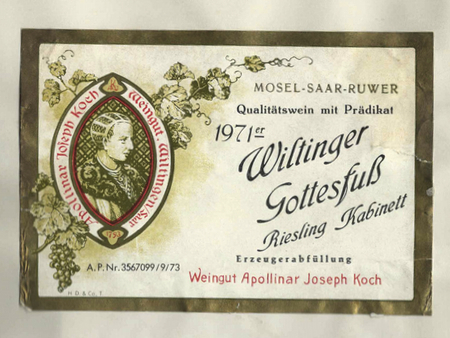 In 1971, most good wine shops in Manhattan and suburban New Jersey carried a small group of estate-bottled German wine, usually from the 1966, 1967, and 1969 vintages; a few even had a bottle or two of German wine from older vintages. 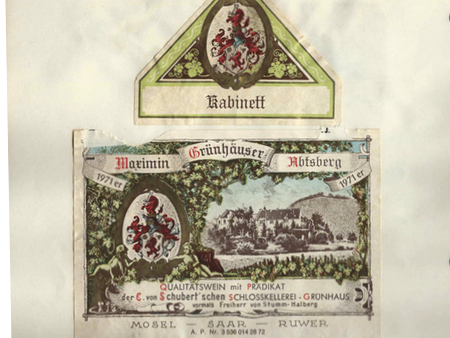 Perhaps because at the time there were only a small number of importers of German wine, one frequently came upon bottles from the same well-established, moderate to large estates in these shops. In addition to the three Rheingau estates mentioned above, Schloss Eltz, Schloss Schönborn, J.J. Prüm, S.A. Prüm, Zach Bergweiler-Prüm Erben, Dr. H. Thanisch, Egon Müller, Karthäuserhof, Maximin Grünhaus, Schloss Johannisberg, Dr. Bürklin-Wolf, Bassermann-Jordan, Franz-Karl Schmitt, and a few others were well represented. Yet, there was one shop that transcended the others and seemed to specialize in German wines: Ambassador Liquors on East 86th Street in the Yorkville section of Manhattan, historically an area with a large German-speaking population. If Schoonmaker’s Wines of Germany was the sacred text, Ambassador was a pilgrimage site. There one could find a large selection of wines, including many from producers Schoonmaker had recommended but were unobtainable elsewhere. By the time I discovered this store, the drums were already being beaten in newspaper and wine magazine articles for the 1971 vintage in Germany. When I visited Ambassador one day in the fall of 1972, I learned that it was offering more than 85 different German wines from the vintage at exceptional, pre-arrival prices, including some from estates that were new to me. I was a graduate student in those days and bought as much wine as I could afford. Little did I realize that this sale constituted Ambassador’s swan song. Soon after the New Year, it went out of business. I continued to purchase 1971 German wines for the next few years, especially in late 1974 when some very fine wines from the vintage suddenly appeared on the market at quite reasonable prices. Rumor had it that this was stock that importers had to liquidate because of the downturn in the economy. What can I say about the 1971 vintage and its wines? Before answering this question I have to offer a caveat. In the 1970s, when I purchased and drank many of the wines, annual comprehensive evaluations and tasting notes from critics like David Schildknecht and Joel Payne were non-existent. I bought many of the wines based on Schoonmaker’s views about the reputation of estates but, as I eventually learned, reputations can change and particular wines from good estates can be mediocre. Furthermore, some of the wines may have been drunk past their prime, while others may have been consumed much too early. Quite a few were disappointing, and there’s reason to believe that the general level of winemaking in the early 1970s was not as high as it is today. Still, I’ve tasted a multitude of outstanding wines from this vintage, particularly in the Mosel-Saar-Ruwer and to a lesser degree in the Rheingau, whose wines at times were dull. Moreover, the best 1971s have constituted the standard by which I have judged non-dry German wines from subsequent vintages, as well as the vintages, themselves. In general, these wines had rich fruit, complexity, and refreshing but not obtrusive acidity. Although the depth of fruit of the 1971 Mosel-Saar-Ruwer wines I tasted resembles that in many wines from the 1990 vintage, I don’t believe their acidity was quite as prominent. In the case of the Spätlesen and Auslesen, the closest parallel for me is with the very best wines of 1997. One additional feature of the 1971 vintage is that the best Kabinett wines and even some Spätlesen from the Mosel had a lightness that one doesn’t usually find in similarly classified wines from recent vintages. No doubt this is a reflection of lower must weights and residual sugar levels at the time. Carl, I’ve heard great things about the 1975 Kanzemer Altenberg Spätlese—or was it Auslese?—from von Othegraven. They seemed to have made top sweet wines in this period. Thank you for the “sequel” to your original article. I actually enjoyed a 1971 Rheinart Ockfener Bockstein Herrenberg Auslese a few years ago, which I found at a Boston retailer. Incidentally, it’s the only bottle that I’ve ever had that was labeled as an Arthur Hallgarten Selection. The only Schoonmaker bottle listed in my notes is a 1976 Schloss Eltz Eltviller Taubenberg Riesling Spätlese that I enjoyed this summer. Gebert is a completely “new” name to me – “new” in quotes because the estate no longer exists. Also, I take it from your mention of Franz-Karl Schmitt that they used to make far better wines than they did in their latter years (sadly, all I ever had from them). Am I right in thinking that Keller bought their parcels in Niersteiner Hipping and Pettenthal?